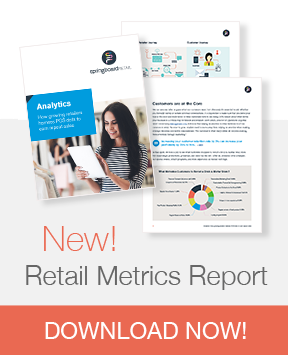 Get a FREE Guide on Effective Retail Metrics. Learn how POS data can help you compete! Do you understand why customers come back through your doors? Or don’t. Do you collect the right data? And are you prioritizing how you use that data every single day to drive decision-making? Do your metrics help you take strategic actions that improve the health of your business? Retail is changing dramatically and competing today means staying agile, pivoting quickly and using POS data to inform everything from inventory to staffing to marketing. "The key to reporting is to have a strategy and a schedule. Retailers need to answer three important questions. What do you want to know? How often do you want to know it? Data and metrics are essential to retail. Download your FREE report Now! Get 15+ Key Reports to run for Sales, Inventory, Purchasing, Marketing, Merchandising and Staffing. Springboard Retail POS gives you a 360° view of your business across all your channels, so you can compete effectively. 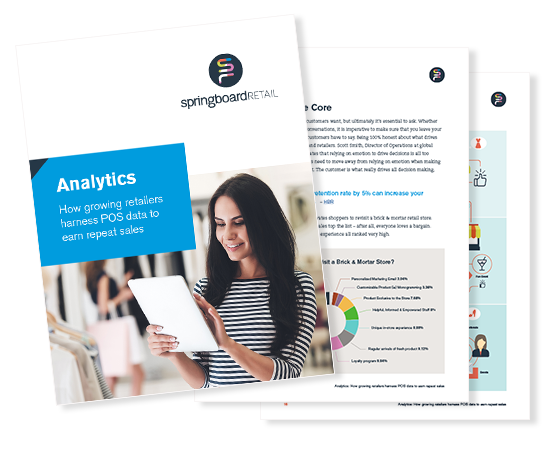 Springboard's easy-to-use reporting and analytic tools empower your team to make strategic business decisions for your store. With custom fields and reporting, dashboards, integrations with top retail platforms and portability across devices, Springboard is quick-to-start, user-friendly and revered by customers nationwide for making their jobs easier.